(a) Install the engine water pump assembly and a new gasket to the timing chain cover assembly with the 15 bolts. Be sure to apply adhesive to the 2 bolts labeled B before reusing them, or replace them with new ones if necessary. Make sure that there is no oil on the threads of the bolts labeled C, D.
(a) Install the 2 No. 2 idler pulley sub-assemblies to the timing chain cover assembly with the 2 bolts. 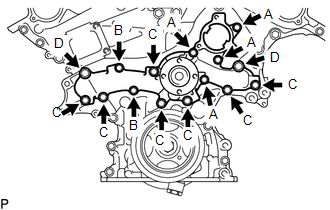 (a) Install the vane pump assembly to the timing chain cover assembly with the 2 bolts. 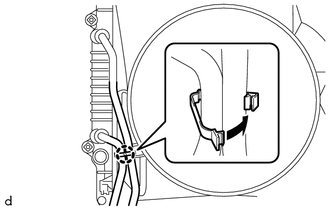 (a) Engage the clamp to install the 2 transmission oil cooler hoses to the fan shroud.